When I have found a landscape which I want to photograph, I wait for the right season, the right weather, and the right time of day or night, to get the picture which I know to be there. Brandt's photographs are relatively straightforward, apart from the series Perspective of Nudes (1945 – 60). He ignored the unusual viewpoints of some Modernist photographers to follow his own social documentary style. Photography is not a sport. It has no rules. 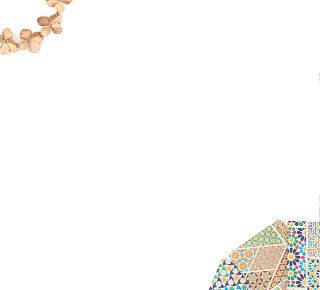 Everything must be dared and tried. The chief hallmark of Brandt's social documentary photographs is formal clarity, which he often achieved in the darkroom by cropping under the enlarger and by emphasizing tonal contrasts in printing. He liked strong geometrical structure in his photographs – a style that was no doubt linked to the chief means of distribution of his photographs – the printed page, either in book form or in magazines like Picture Post or Lilliput. Brandt's view of Hadrian's Wall from the 1940s (published in his book Literary Britain, 1951) shows how he would crop a dynamic image out of a larger negative. (Left) Hadrian's Wall (full frame), photograph by Bill Brandt, 1943. 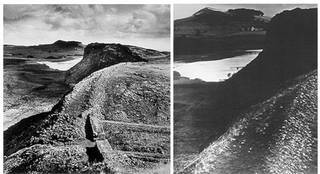 © Bill Brandt Archive Ltd. (Right) Hadrian's Wall (cropped view), photograph by Bill Brandt, about 1935. © Bill Brandt Archive Ltd.
Brandt also used montage, combining portions of two negatives in one print. A striking example can be found in his first book, The English at Home (1936). The seagull, impossible to photograph with clarity under such low light conditions, was montaged onto a scene of the Thames river in fog. A few years later Brandt added a morning sun to the scene. This was required for a feature in the magazine Lilliput, in which Victorian London (as seen by Gustave Doré) was compared with the London of the 1930s. (Left) Early Morning on the River, London Bridge (1), photograph by Bill Brandt, about 1935. 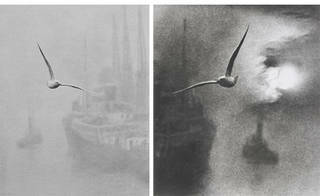 © Bill Brandt Archive Ltd. (Right) Early Morning on the River, London Bridge (2), photograph by Bill Brandt, about 1935. © Bill Brandt Archive Ltd.
Another characteristic of Brandt's documentary photographs is his use of his family and friends to act out social roles. His brother Rolf and sister-in-law Ester are often to be found in his early books. 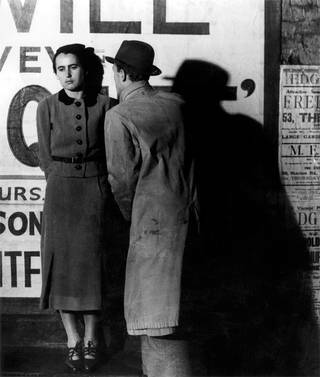 Street Scene or Couple in Peckham, photograph by Bill Brandt, 1936. © Bill Brandt Archive Ltd. In 1945 Brandt bought a special Kodak camera in a second-hand camera shop in Covent Garden, London. The camera had been designed to enable untrained police staff to photograph crime scenes. It had a very wide-angle lens. Compared to the standard lens of the Rolleiflex camera Brandt had used for his documentary photographs, the Kodak allowed him, he wrote, to "see like a mouse, a fish or a fly". He first used it for photographing nudes in interiors and then continued on the beaches of southern England and France. Later he used a Hasselblad camera with a Superwide-angle lens. 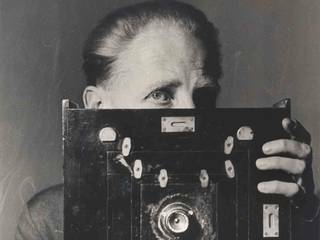 Discover more about Bill Brandt. Background image: Background image: Bill Brandt, 'Early Morning on the River, London Bridge', about 1935, 2. © Bill Brandt Archive Ltd.